European countries continue to dominate the overall rankings in the Global Competitiveness Index, accounting for six of the top 10 and 10 of the top 20. These economies, all from the north and west of the continent, have mostly now recovered to their pre-crisis levels of competitiveness. Further east and south, the picture is less encouraging: the five countries with advanced economy status which were ranked as least competitive in 2007 – Slovenia, Portugal, Italy, Cyprus, and Greece – saw their GDP growth fall further, and recover more slowly, than their more competitive peers. Greece ranks lowest overall of the advanced economies in the latest Index, at 81st out of 140. Some advanced economies outside Europe’s top 10 are seeing the benefit of reforms: France, Ireland, Italy, Portugal and Spain, for example, have all progressed in the areas of market competition and labour market efficiency. Yet other factors are dragging down competitiveness: in the eurozone, finance remains more difficult to access than eight years ago. The eurozone’s monetary policy and the Russian recession are among factors challenging Europe’s emerging economies, who range from 36th (Lithuania) to 111th (Bosnia and Herzegovina) in the overall rankings – but their growth is projected to remain steady, with the Baltics generally doing better than those in Central and Southern Europe. Switzerland. Europe’s top performer is also the top performer globally, heading the Index for the seventh consecutive year. Switzerland has shown resilience in the crisis, thanks in part to its strong fundamentals: it leads globally in three of the 12 “pillars” on which the overall ranking is based – innovation, business sophistication and labour market efficiency – and is the top ten in ten of the 12. Yet the country faces some challenges to its continued dominance, uncertainty about future immigration policy and a low female participation rate. Germany. 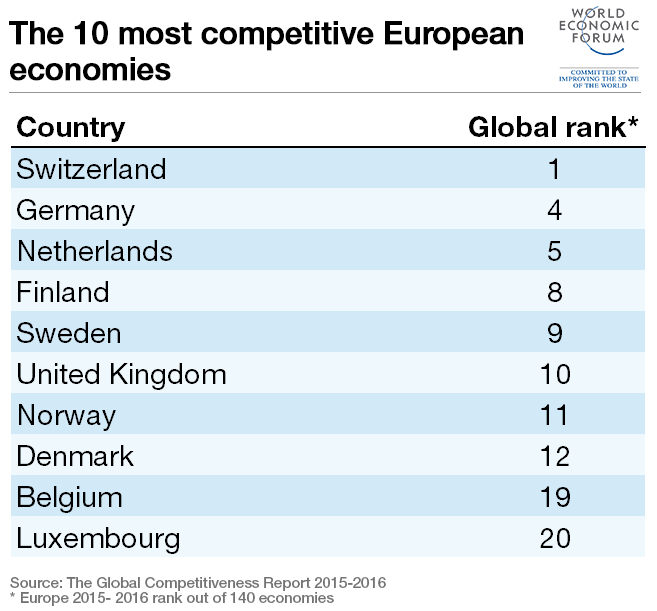 Up one to 4th place overall, Germany has also been one of the most resilient economies in recent years and shares many of Switzerland’s strong fundamentals in the more complex areas of competitiveness – those related to business sophistication, innovation, research and technology. Its improvement on last year’s position reflects strengthened efficiency in the financial and labour markets – the latter, admittedly, from a low base – and an improved macroeconomic environment, thanks in part to a reduction in government debt. The Netherlands. Matching its best-ever position of 5th in the overall rankings, the Netherlands gains three places on last year thanks to small but generalized improvements. The Dutch economy is sophisticated and innovative, with an open and efficient goods market, and performs strongly in the pillars of education, infrastructure and institutions. Its weaknesses include labour market rigidities and a financial market that has yet to recover from the crisis. Finland. Sliding by four places to 8th overall, Finland’s relatively undiversified economy has suffered from shocks to the information technology and paper industries as well as the recession in Russia, one of its largest export markets. Its GDP last year was still 6% off its levels of 2008. Yet it still has some strong fundamentals, characterized by strong institutions, an excellent education system and a strong capacity for innovation. Priorities for arresting its slide in the overall rankings include fixing long-standing rigidities in its labour market and a growing public deficit. Sweden. Typically for Scandinavia, Sweden’s institutions are transparent and efficient; in combination with its excellent education system, sophisticated businesses and wide penetration of ICTs, this creates an ecosystem conducive to innovation. The two biggest concerns for executives doing business in Sweden are its restrictive labour regulations – although mitigated by good relationships between employers and workers – and rates of tax which continue to be high by international standards. The United Kingdom. Although registering some improvements, the UK slips behind Sweden in this year’s ranking, with its main area of weakness being macroeconomic – the government deficit remains very high at 9% of GDP. On the positive side, the country has created conditions for its service sector to flourish and to establish London as Europe’s leading tech and start-up hub. Norway. Ranking 11th in the overall index for the third successive year, Norway is seen as having most stable macroeconomic environment in the world; it also registers top-10 scores on the pillars of institutions, higher education and training, technological readiness, financial market development and labour market efficiency. Its weakest points include infrastructure – especially roads and railroads – and some elements of the market efficiency pillars, such as relatively high overall tax rates and inflexible wage determination mechanisms. Denmark. Denmark benefits from strong higher education (9th) and labour market flexibility (10th). Drilling down into education indicators, more needs to be done, however, to address the quality of the higher education system. Denmark also needs to address its relative weaker performance in infrastructure (22nd) and goods and financial market efficiencies, where it ranks 20th and 22nd respectively. Executives who contributed to the Executive Opinion Survey, which forms part of the Index, ranked the rates and complexity of tax as their top two issues. Belgium. Dropping four places in the last four years, Belgium ranks 19th overall on this year’s index. Its biggest strengths are in public services – the country’s top ten rankings are on the pillars of health and primary education, and higher education and training. Its weakest pillars are macroeconomic environment and labour market efficiency, although in both cases it has improved slightly in the last year. Financial market also remains a concern, especially its trustworthiness and confidence. The country outperforms its overall rating on the business sophistication and innovation pillars, but has dropped two and three places respectively in the last year. Luxembourg. Rounding out Europe’s top 10 and the overall top 20, Luxembourg leads the world on the technological readiness pillar, which combines measures including penetration of internet with private sector use of innovations. It also makes the top 10 on the pillars of goods market efficiency and institutions. In contrast to neighbouring Belgium, two of its weakest pillars are health and primary education and higher education and training; executives say inadequate education of the workforce is their biggest concern for doing business. How can Europe raise its competiveness?